Now that the mercury has begun rising (then dipping, then rising again) my 3 year old is keen to dispense of such inconveniencies as clothes and indulge in his favourite pastime – water play. September is probably a little early for most of us to consider plunging into cold water in the great outdoors, but it would appear that little ones have no such doubts. If your tinies fancy getting in on the action this summer, take them along to some of these watering holes which we have discovered over the last few summers. Some are free, some are fancy, but they're all very wet! Ian Potter Foundation Children's Garden at the Royal Botanic Gardens – An oldie but a goodie and revamped for summer 2011 to include the fantastic new spiral fountains, which spurt from the ground unexpectedly. There's also the bubble rock which little kids love and a wonderful little river which meanders through the garden, under bridges and around vegetation. The various features operate at certain times on certain days and in certain temperatures so be sure to check the RBG website to avoid disappointment. The bubble rock at the Children's Garden is guaranteed to intrigue. Oakleigh Recreation Centre – Again, recently revamped and in my opinion one of the best outdoor pools in Melbourne. Your kids will all be catered for here because there's something for all ages from the toddler pool, to the great fun splash pad, to the giant inflatable slide. Check the website to see when their outdoor season starts and for special events as there's often extra kids' activities happening over the summer school holidays. Funfields – Located in Whittlesea, this theme park is great for a special day out. There is a huge outdoor pool complete with a wet adventure playground featuring all the tipping buckets, slides, jets and fountains you could hope for. In different areas of the park there are also large water slides suitable for older kids and adults. Entry prices are judged on height and therefore on how many attractions your child will be allowed to use. Look at the website for more details. What child can resist the excitement of Funfields? Seville Water Playground – Now we never actually made it to this one last summer, but it's definitely on our to do list this year. Seville, located in the Yarra Ranges now boasts its own water playground for residents and tourists. Featuring all sorts of interactive water features it looks like a ton of fun. Beware that it was closed for a short period at the start of 2012 over health concerns but was up and running again by Easter 2012. Call 1300 368 333 for more information to avoid disappointment, just in case. Lilydale Lake – Another one on our to do list, Lilydale Lake is an artificial lake located in Lilydale, in Melbourne's north east, about 35km from the CBD. There are many recreational pursuits available if you fancy making the effort, but the kids will probably be just as happy to splash in the shallows of the lake on a hot day. There is also a huge adventure playground, walking tracks and BBQ facilities so you can easily make a day of it. 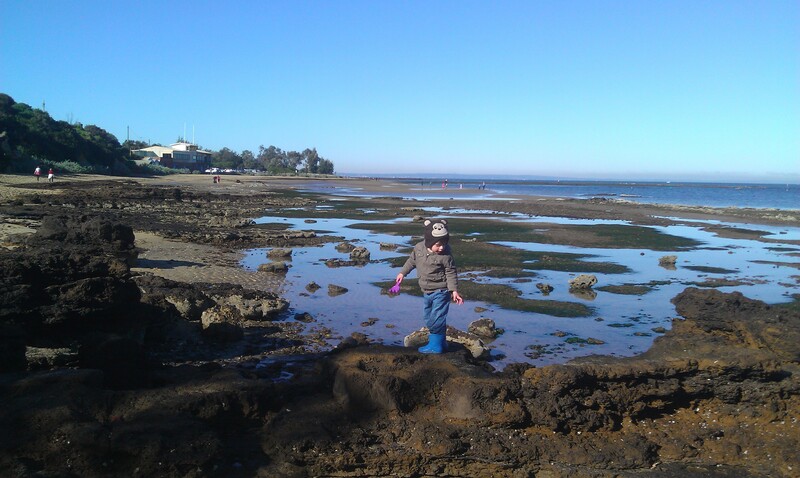 Ricketts Point rockpools – When the tide goes out at Ricketts Point, miles of rockpools are uncovered and ready for your kids to discover the secrets of the sea. Ricketts Point in Bayside is a curious kids' paradise. Arm your offspring with buckets and spades and see what delights they can find. You'll be surprised how long they can amuse themselves poking around for crabs and starfish and pretty shells. Noble Park Aquatic Centre – Another redeveloped gem, tucked away in Melbourne's south east. This one opened in 2011 and features a great water and splash play area outside where the kids can burn off heaps of energy. The great thing about NPAC is that you can wander to and from the indoor pool to the outdoor area which are separated by huge glass partitions that flip open in the summer months for free flowing movement around the complex. Royal Botanic Gardens in Cranbourne – The Rockpool Waterway is great fun for little ones to wade in (between the flags only). Every few minutes extra water comes flowing down the Waterway and over the falls at the end, much to the kids' delight. Geelong Adventure Park – This is Victoria's biggie in the theme park stakes. More suitable for families with older children, there is pretty much every type of water fun you could imagine. From the relaxing Lazy River to the pitch black Wild West Canyon, you'll find plenty to keep everyone occupied. Be aware that it does get very busy particularly in the school holidays. Check the website for details on prices and height restrictions on various attractions. Frankston Waterfront Beach – Once you've paid to park the car and been conned into buying the kids an ice cream, you have a free day of the simplest kind of water play. Frankston Beach is one of our favourites because there's no sharp dip from the sand to the sea and the water stays shallow for ages which is great from a safety aspect for parents. The best area (cleanest and clearest water) is the part of the beach opposite the playground; to the left of the pier if you're looking out to sea. Your little ones can splash in the shallows, build sandcastles and when they tire of the beach, head up to the great playground. Victory Park in Chelsea is also a great park/beach combo with similar plus points. Share any of your outdoor watery finds as I am sure there are many more waiting to be discovered by Melbourne famililes.